You can add years of life to your gate with simple annual maintenance. Some of the maintenance requires access to your gate operator. If your operator has key lock cover or access door and you have lost track of the key, contact us for a replacement. Before working on gate make sure power is turned off. 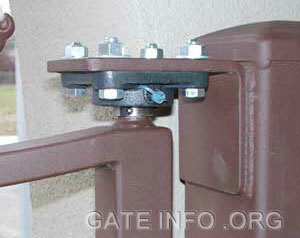 Hinges take the brunt of usage in your gate installation. Almost all hinges have a grease joint (zirk fitting). Use of a standard grease gun and a tube of heavy grease available at any hardware or auto parts store is all you need. Pictured here is a sealed flange bearing. Many times there is a plastic cap over the zirk fitting. pump grease in until you see some coming out of the bearing. You are not actually greasing the the bearing because it is sealed, but rather the gimbaled joint that the bearing moves around in. Find sealed bearing adjustable hinges here. There are several sizes of these popular hinges. 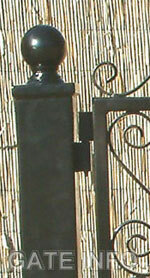 Smaller ones are found on garden gates and larger ones can hold a driveway gate. The Hinge pin is usually stainless and sits on one large ball bearing. These hinges take a lot of lateral weight (sides of pin on wall). They wear rapidly when not greased and the cylindrical pin hole becomes oval shaped and the gate starts to sag. This type of hinge requires that you stay on top of keeping it greased. You should do it annually. The grease fitting (zirk fitting) is located on the bottom. Use of a standard grease gun and a tube of heavy grease available at any hardware, or auto parts store is all you need. Pump grease in until you see some come out around the pin. 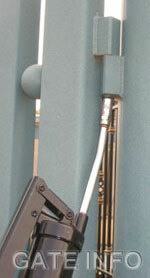 Find block style gate hinges here. Find slide gate hardware here. 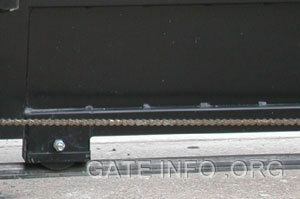 All slide gate with chains, have tensioners. Most of them have one at each end of the chain. As the gate operates over time the chain stretches. The chain should be tensioned periodically as needed. You can tell when it needs tensioning by how much the chain sags. 2" of sag is normal in a 12'-16' gate and more in longer gates. There should always be a little sag in the chain. A chain that is too tight (looks like a strait line) will wear the idler wheel and the sprocket inside the operator. If the tensioner is fully tightened and there is still too much slack in the chain, you will have to remove some links. They should be removed at the end of the chain. This is a difficult task and you should consider having a professional do it. It requires grinding the head off of one of the link pins and removing as many links as required to reset the tensioner's to their begriming position. There is a master link at end of the chain connecting each tensioner. Find slide gate chain and chain tensioner's here. 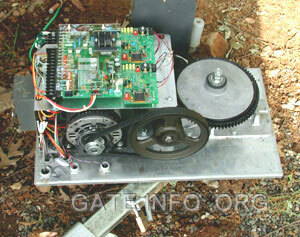 Use heavy grease on the rim gear (large diameter plastic gear). Check to see if there is any plastic dust or shavings coming off the gear. That indicates misalignment. The aluminum cast housing below the gear assembly has a zirk fitting. That should be greased using a grease gun. Check the motor V belt tension. it can have a bit of play in it and still function fine. If it is too loose it will start to slip. Look for cracks in the belt, which indicates that replacement is needed. The two nuts you see on the top of the plate of the ring gear, is the clutch adjustment. 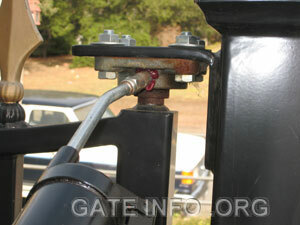 If the gate is slipping, or has too much or too little force, you can adjust it here. Test your gate by holding the end of it while it is in motion. It should have about 8 - 15 pounds of force. You can measure it with a fish scale. Be very careful with this adjustment. It is the key safety feature of your operator. The emergency lock located on the bottom arm should be lubricated with graphite. A little oil around the lock pin that goes through the arm is good to keep the pin from seizing up. It will also make it easier if you need to remove the pin should an emergence occur. Squirt some graphite into the cover lock as well. 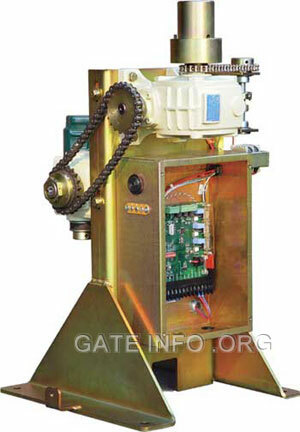 Find Doorking gate operator 6100 series replacement parts here. Grease all chains with heavy grease. Check tension of chains. Replace if there is excessive slack. Remove insects, webs, and the occasional dead critter. Some of these operators have sealed flange bearings for the drive axle. These bearing generally have a grease fitting. They should be greased using a grease gun. Put a little light oil on the shaft where the collar from the gate arm assembly slides over. This will keep it from rusting and making it hard to remove in the future. Check the motor V belt tension. If it is too loose, tighten it. Look for cracks in the belt, which indicates that replacement is needed. Check cover of circuit board compartment to make sure it is fastened. Any unused open holes in the control box should be plugged to prevent insects and lizards from entering. Inspect battery for corrosion around the terminals. Battery should be replaced every 5 years. The gate may be working fine, but will not operate very long when there is a power failure because it cannot hold a charge. Use a permanent marker and write the replacement date on the new battery. You can purchase these batteries through us. If your Roboswing is using a solar panel, clean it at least once a year. Windex works fine. 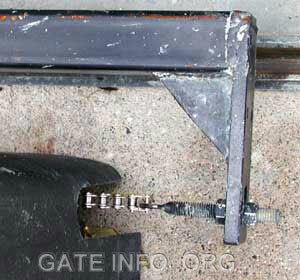 Find Elite gate operator replacement parts here. Clean solar panels at least once a year. Windex works fine. In very dusty locations it should be cleaned more frequently. A thick layer of dust and dirt lowers its efficiency dramatically. A good high end solar panel lasts about 20 years. Cheaper ones may only last 5 years. If your gate is loosing power check the battery. Batteries should be replaced every 5 years. Most operators use gel batteries pictured here. Some use car batteries. Replace older batteries. Use a permanent marker and write the replacement date on the new battery. You can purchase gel batteries through us. If your battery is new and it does not hold a charge, it can be one of two things. It may be the voltage/charge regulator (if there is one) or the solar panel is at the end of its life cycle. If your solar panel is connected directly to your battery, there is no regulator. Most 12 volt panels put out 18 volts. Voltage coming out of a regulator (after the solar panel) is around 13.85 VDC. Batteries getting less than 13 volts will not charge properly. 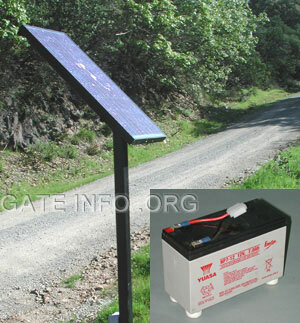 Find solar driveway gate equipment here.